We are working to create a vibrant community of practice around participatory and decentralized local government. This community will be used by its members for a variety of reasons, including elevating local democracy in international development discussions, but what exactly is a community of practice and how is one best formed? Etienne Wenger, Richard A. McDermott and William Snyde state in Cultivating Communities of Practice: A Guide to Managing Knowledge that communities of practice are “groups of people who share a concern or a passion for something they do and learn how to do it better as they interact regularly.” Though the coinage of the term is new, the ideas behind it are fairly old — just think of guilds or apprenticeships from antiquity. Together, individuals in these groups combine their knowledge to establish norms, to create generational memory of certain lessons, and to help each member adapt as their field evolves. Design for evolution, or, allow the community to develop overtime and adapt to the needs of its members. Open a dialogue between perspectives inside and outside the community so that the community’s strategic potential can increase. Invite different levels of participation so that all members have a role to play based on their interests and commitment. Develop both public and private spaces – official events organized for all members as well as one-on-one interaction among members. Focus on value so that the community stays relevant. Combine familiarity with excitement. Familiarity breeds a comfort level that encourages candid discussions while excitement provides novelty and spontaneity that can increase membership. Create a rhythm so that members can know when to expect and plan for activities. 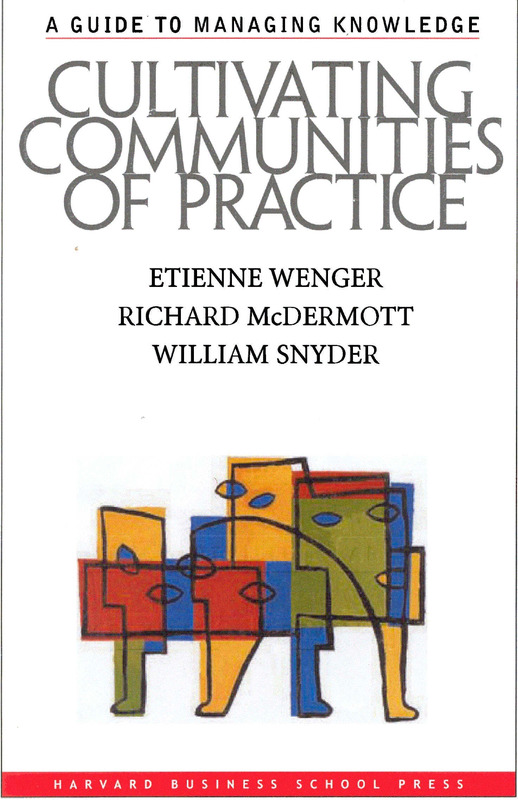 The authors seek to enable readers to understand and cultivate communities of practice on their own by applying these principles – and also discuss the short and long term benefits of communities of practice, while also showcasing potential pitfalls. One of the short term benefits of a community of practice is that it provides an arena for members to address the challenges they have faced. The authors first look at how communities of practice have been used in car companies – demonstrating that the community allows people to get quick answers to questions, to find resources, and to access expertise. These benefits reduce the time and cost necessary for members to accomplish difficult tasks for the company. Communities of practice also increase the number of perspectives brought to bear on problems, which improves the quality of the resulting decision or solution. The greatest long term benefits of a community of practice build on this capacity, allowing members to develop new solutions to problems and a greater capacity to take advantage of emerging opportunities in technology or changing political and economic situations. The authors address many of the potential problems that arise in communities of practice, but it devotes an entire chapter (Chapter 6) to discussing the difficulties of “diffused communities of practice.” Thanks to advancing telecommunication technologies, communities of practice can now form on a much wider scale, and these “are becoming the norm.” However, these diffuse communities present their own problems: the potential for an unwieldy size, members’ distance from each other, and the attendant problems of affiliation and cultural differences. Due to these problems, communities need to take more time “to reconciling multiple agendas in order to define the domain and to build trust between members.” The community must also create a structure that promotes both local variations, but also global connections. Our community of practice has begun to use this website to create an overarching structure, and we have begun discussions on defining our domain and terms within the Participatory Local Democracy Community of Practice. We hope that you will join us in a lively discussion of the domain in which we all work, and submit your thoughts, ideas, problems, and solutions as time goes forward.